Domestic cats that have free access to the outdoors will still often engage in hunting activity even if there is no access to prey – eg playing with fallen leaves, or grass blowing in the wind. It is important to allow cats opportunities to exhibit hunting behaviour, as it keeps them mentally stimulated and releases feel-good hormones called endorphins. Indoor cats aren’t able to play outside, so it is important to provide them with toys and activities to keep them occupied. Cats should be provided with a stimulating and safe indoor environment, whether they go outside or not. 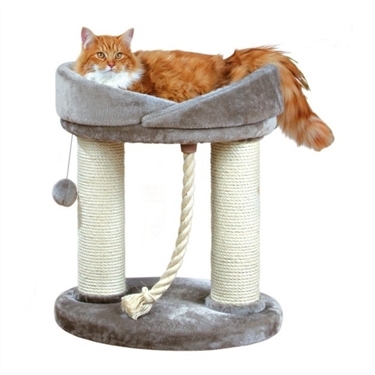 If your cat is solely kept indoors, then this is particularly essential. If you have more than one cat, offer enough resources in different locations where your cats can eat, drink, toilet, rest and hide. Cats like to eat and drink away from their litter tray, as understandably, it’s more hygienic. However, many people don’t realise that cats also like to have each of their food and water bowls in separate places too. This stems back to the cat’s evolutionary past, when they would eat in a different area to avoid contaminating their drinking source with the remains of their prey. Avoid putting food and water bowls next to each other. Eating and drinking can be vulnerable activities for a cat – so try placing bowls slightly away from the wall, so that a cat can sit with his back to the wall and view his surroundings. Cats are all individuals and therefore have difference preferences for types of bowls, for example plastic, ceramic or metal bowls. Cats in the wild spend a lot of their time on short, frequent hunting expeditions. In comparison, domestic cats are given food bowls, so it doesn’t take long for them to eat their daily ration or make use of their great senses. Try using feeding puzzle balls to give part, or all, of your cat’s daily ration. It is best to let cats get used to this gradually, to ensure they have enough to eat and don’t become frustrated. get involved too – you can use fishing rod toys with feathers on a string to mimic their prey! adapted to suit their needs and level of mobility. should be given to elderly cats. blanket inside will also do the trick. Cocksfoot grass can be grown indoors. Seeds are readily available from garden centres and pet shops. If no grass is provided, your cat may try to eat other household plants which can pose a risk. It is a good idea to have one litter tray per cat, plus one extra – especially if your cats are kept indoors. and a litter of a sandy texture. Make any changes to the tray, the litter or its location very slowly to avoid accidents.